Trusted by the pros to take on the harshest conditions, the tough WILDPEAK M/T is built to get you there and back whether you’re on the pavement, mud, snow or rocks. The M/T features Falken’s proprietary three-ply DURASPEC™ Sidewall Technology developed to sustain the most punishing off-road conditions. DURASPEC™ also features two high ply turn-ups that provide an additional layer of protection and durability. An aggressive upper sidewall provides additional traction at low air pressures on rugged terrain. The WILDPEAK M/T also features exceptional road manners thanks to an optimized variable three-pitch tread pattern and precision manufacturing technology. 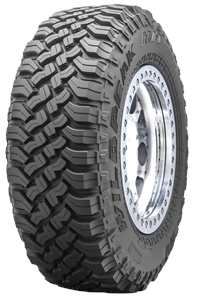 is a Falken proprietary technology developed to endure the most punishing off-road conditions. DURASPEC also features two high ply turn-ups that provide an additional layer of protection. in the lower sidewall dissipates heat to protect the internal tire components. Keeping this critical area of the tire cool ensures vehicle stability even when towing or carrying heavy loads. feature step-down supports on the center blocks to provide tread-pattern rigidity in the contact patch, enhancing stability and handling while preventing stones from becoming trapped in the grooves. along with offset shoulder blocks protect the tire from sharp rocks and provide additional off-road traction at low tire pressures or in off-camber situations. shed mud from the tread grooves to prevent loss of traction, ensuring maximum grip while preventing rocks from puncturing the base of the tread. with three variable pitches positions the tread blocks to provide an exceptionally quiet ride. Purchased my V40 here. The staff are friendly and the service work done seems to be at a good standard. However, the sales process was not entirely smooth as the dealer turned up late to our appointment and could not adequately explain the features and history of the car despite the fact that it was purchased as an ex-demo. I discussed a test drive with Kerri on Wednesday for the coming Sunday via the instant messenger function on Autotrader. Kerri seemed very friendly and helpful, promising that someone would contact me on Thursday to arrange a time. It's Sunday and we haven't heard anything. For me, this set alarm bells ringing. If they couldn't make contact to sell a car, who knows what will happen if I buy a car from them and need some after-sales care? We're currently looking elsewhere. Worst experience of a dealer ever!! !